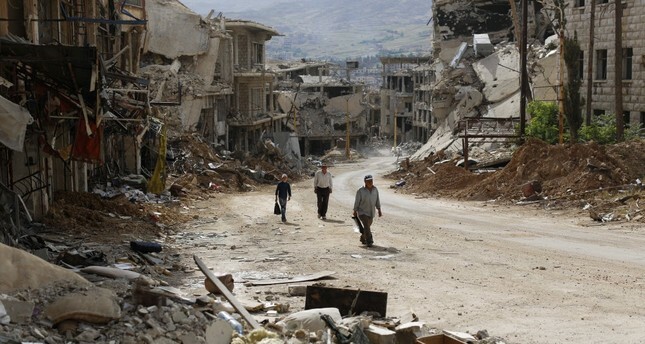 Syrians walk among damaged buildings on a street filled with debris at the mountain resort town of Zabadani in the Damascus countryside, Syria, May 18. Twenty-four-year-old Ahmet, who lives near the Syrian border in the Reyhanlı district of Turkey's southern city of Hatay, tells the story of one of his close friends, Abdullah. Ahmet says that when Abdullah and he were students in Damascus, Syrian intelligence took Abdullah away in a raid on a mosque when the first mass protests kicked off. That day, intelligence officers gathered people, who were present in the mosque courtyard, by mercilessly bludgeoning their faces. The only thing wrong that Abdullah did that day was being in the wrong place at the wrong time. His family and friends did not hear from him or receive any news about his situation for more than two weeks. Seventeen days after this unfortunate incident, an appalling phone call came from Abdullah, saying, "I'm completely naked; I'm coming by taxi; can you get me some money to pay for the fare and to buy me some clothes?" When Abdullah finally arrived at the door of the house where he and Ahmet were staying, his desperate appearance, his dramatic weight loss, broken arms and swollen eyes, showed that he was subject to unspeakable torture. Abdullah later told Ahmed that he was held in a 10 square-meter cell with some 26 others. When I first heard this story, I couldn't believe it. I had to ask Ahmet "How this could be possible?" A total of 17 days, full of torture, in a very small cell where 27 people had to literally sit on top each other… It is really hard to imagine. Almost one year later, Abdullah was arrested once again and his mother immediately started going from door to door to find her son. Finally, a regime correspondent told her, "I'll bring you your son but you have to pay me $50,000 first." The family sold their entire savings and gave the money. When Abdullah's mother excitedly arrived at the prison to see her son, the guards threatened her and told her, "You can only see him, you can't talk to him. If you say even a word, we'll kill him." In her meeting with Abdullah, the only thing they shared was tears. As it seems, Abdullah was threatened just like his mother. That meeting was the last time they saw each other. Another sad story is that of a 24-year-old Syrian girl, Ümmü Ala, who lives with her two children in Reyhanlı. Her husband and father were killed by Bashar Assad regime officers. Four years earlier, her nine-year-old brother was shot by a regime sniper while playing on the streets in Syria's Homs. In 2012, Ala was arrested by the regime and was imprisoned for three and a half months because her older brother joined the Free Syrian Army (FSA). "How come?" I asked her. "Did they arrest you just to take revenge from your brother? Didn't you join the protests?" She responded, "Yes… It was for revenge. I used to work as a cleaner in Homs. I didn't go out to join the protests even for just a day." I was curious about her story and started asking her questions to learn about the kind of a place that she was held in and what she experienced there. She told me that she was held in a room with 45 or 50 women. Showing me her teeth, she said that they were all broken when they struck her with metal sticks. Turkey's Humanitarian Relief Foundation (IHH) fixed her teeth, and she is very thankful to them. "They were torturing us. My turn was generally on Fridays," Ala said. Showing her toes, Ala said all her toenails were hammered one by one; she was beaten over and over. She said that she was raped and added that all the women were treated the same way she was, and some of them even died due to the torture or the contaminated water that they gave them to drink. Until fleeing to Turkey to save her life, Ümmü Ala was in Homs, one of the Syrian cities where heavy occupation was taking place. I asked her, "How were your days in Homs?" and she replied that one day her brother shot a cat and a dog, brought them to their home and skinned them and they ate them. She added that they ate wood chips, leaves, grass and so on for a long time. It was exceedingly sad for me, when I heard Ala's story. I know that talking about Syria or Syrians is not the popular thing to do anymore. Further, if you talk "too much" about Syria in the media, you can easily hurt your reputation. After all that has happened, it is unacceptable to see that there are still some people saying that, "We must compromise with Assad." Here are Assad's wrongdoings to humans – a tyranny that leftists, far-rights and "anti-Daesh" groups currently see as "an indispensable partner to provide peace in Syria." So far, hundreds of thousands of photos proving the Assad regime's civilian torture in prisons have been released; yet unfortunately it's not enough to draw the attention of the international public conscience. I know that neither Abdullah nor Ümmü Ala's stories are likely to draw much attention. However, if there are still some people among us seeking the truth, they, without hesitation, must talk about those stories to comprehend what's really going on in Syria. If we think those tragedies are just part of the war in Syria, it is not true, instead, we mustn't fail to notice the reasons behind this war. Ala is now living in a so called house with a rent of TL 400. She pays the rent with the help of the IHH. When asked how she earns a living, she answered that she sometimes cleans the houses of some wealthy Syrian families. But most of the time she said, she was in need and even a penny would help. If you want to understand the tragedy of Syrians, just think of the millions of Abdullahs and Alas out there. Today, Syrians are either forced to live far away from their homes, with nothing, or to return back to their homeland where their names are blacklisted by the Assad regime and face its revenge scenarios. It is for sure that today the people, who are redrawing Syria's maps, are ignoring the sufferings of Syrians, but history has recorded their deeds and future generations will not forgive the Assad regime or those who sit back and just watch the tragedies unfold. And we'll also continue remembering and reminding people not to forget about the sorrows our Syrian brothers and sisters face every day.